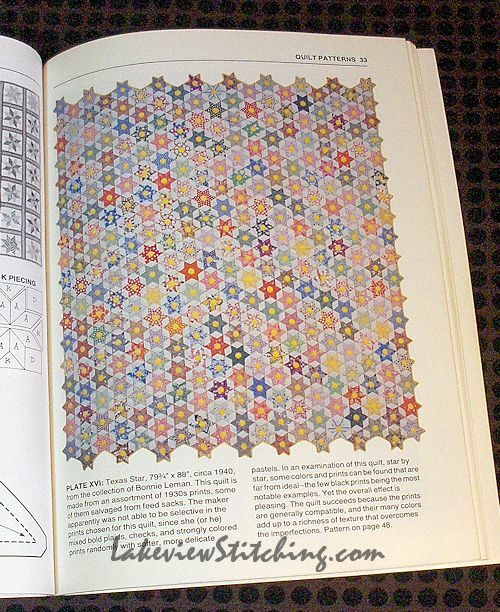 There are probably dozens of different quilts called "Texas Star." This one is from the 1940s, and was one of the projects in the first quilting book I ever bought, Scrap Quilts by Judy Martin (1985). 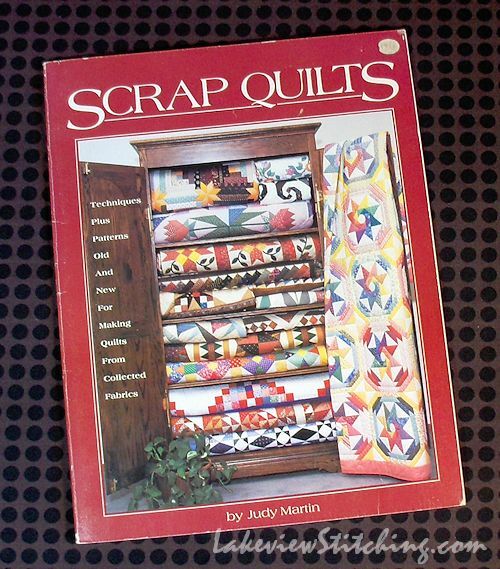 There are three quilts in this book that are on my quilting bucket list, however everything in the book is done from templates, and I never got the hang of them. I would not be a quilter today if we were still piecing from templates! I did try, though. I started this quilt back in the late 80s using samples of home decor fabric, sewn on the machine. I abandoned the yellow middles almost immediately, but I did manage to make around 200 stars. I didn't get very far with joining them together though, and it became my second quilt UFO. I found it all in my big stash clean-out 18 months ago. Both this one and my first UFO from the late 70s went in the garbage. Some of you may cringe at the thought, but for me it was very helpful to start fresh(er). So when I discovered English Paper Piecing, this quilt immediately came to mind. The original is based on 1.5" diamonds, but I wanted to make it a little smaller, so I am using 1.25" diamonds and 5/8" hexagons and jewels. I emailed the people at Paper Pieces to ask about a custom order for the 5/8" jewels, and they were able to accomodate me immediately. It did not even cost any more than a regular stock item, and they are now permanently added to their website. I just love this company! I have bought a little fabric for this quilt, but mostly I plan to use up the 1930s reproductions in my stash. In the book Martin calls the mix of colours and use of black "far from ideal," but to me that is part of the charm, so I am hoping to duplicate the look. None of my tv projects recently have involved fabric, so it is nice to be back to it again. Do you think I have enough to do now? such a busy lady, what a good isea to buy your paper pieces wonder if you have got very far. I am not sure about throwing away things, I have done it once or twice and have regretted it though I must admit I could do with a sort out of sorts! For me, buying them is the way to go! It gets you to the fun part right away, but even more important, you can be 100% sure that they are all going to fit together in the end. Especially in a design like this one with many different shapes. As for the clean out, I still kept much more than I tossed! But I don't regret any of it. my mother passed over so many ufos from the same era and in the end i had to be ruthless and just throw a whole lot out. i do have quite a few that are still worth working on though. 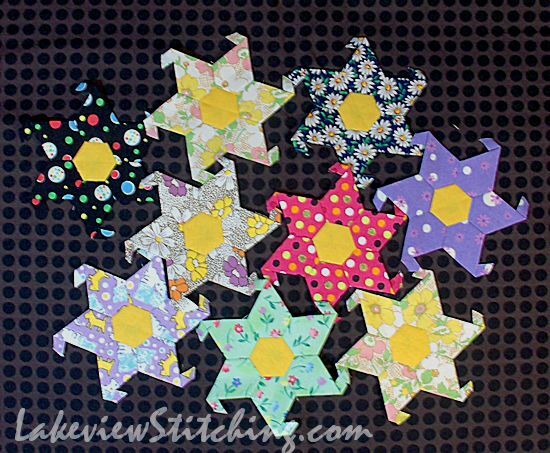 i really enjoy paper piecing hexagons and love the look of your texas star project too. Thanks, Katherine! It's a little bit of variety. I agree that it helps to be ruthless sometimes. If it's not going to be fun to finish them, I definitely think they should go! I do like the design - the stars look as if they are walking. Also took a look at Paper Pieces. My one and only effort at paper piecing took about 30 years - but I was tempted to send off for some packs of pieces! However, I really DO have enough to do, so I shall follow your with interest. You're right, Jillian, they do look like they're walking! Those tails will go to the back, though, once the white diamond fillers go in. I agree, you have to draw the line somewhere. There's a lot of temptation on that site, though! Love your stars! I have a project like this one somewhere in my sewing room. Maybe after all the hexies I will get back to them. Thanks, Hetty. They make a bit of a change! I almost bought that book a few months ago. It's looking great. I need to work on my paper piecing more often. It's slow going!! It's good to know that book is still floating around. Some of the quilts are very dated, but there are some variations on classic designs that stand the test of time. That reminds me of the Seven Sisters I have from a great aunt. It's in storage, half-way hand-quilted by me years ago. I hope to finish it in a couple of years, when I can afford a trip to Arizona to get my things! Yours is going to be beautiful! I wish I'd known you before you threw away the UFOs! I turn those into quilts for American Hero Quilts. =) I think my previous comment went astray due to a timeout, so just let me say this is a gorgeous quilt you are working on. I love paper piecing hexies. Thank you! Both comments are here, you see, but they are moderated, so they don't post right away. It keeps away all the weird spam comments!